When you pick up a package of polymer clay, you’ll find that there’s not much information on the label. There’s no ingredient list, no “best practices” discussion, no way to solve problems when things go wrong. There’s also no information to help you learn about polymer clay as a medium for creating art. You can work with clay for decades and not know how it really works. Wouldn’t it be great to have a textbook where you could learn about polymer clay? I wrote a book specifically to address this gap in polymer clay instruction and knowledge. You’ll find the answers to all your questions about the material itself. How long to bake? How do you condition polymer clay? What’s the difference between Fimo and Sculpey? Is it toxic? Can you mix brands of clay? How durable is this stuff? And this is just the beginning of your questions, I’m sure! The subtitle of the book is “Information for All Clayers”. I truly do mean that. Everyone will learn something new here, even if you’ve worked with clay for years and years. And it because I’m not talking about techniques, this information is valuable for you no matter what kinds of things you like to make. All clayers want to learn about polymer clay, and this eBook helps you do just that! Hopefully you never stop learning. 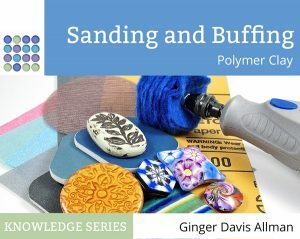 And this eBook is designed to help you understand the material of polymer clay better. It is, after all, an artistic medium that’s unlike any other. With the technical and practical aspects learned, you won’t worry about baking or chemical incompatibility failures. Now you can enjoy making art, like you’ve always wanted to do! Thanks for another super book – Your efforts save many of us soooooo much time, money and frustration! There may be a small glitch on page 35 – the address given for Ann and Karen Mitchell’s website is correct, but the link doesn’t open correctly for me. Ooh, good catch. Thank you. I’ll change that in the next release. Your Essentials EBook is fabulous. It answered all my questions and more. I would highly recommend it for anyone seriously wanting to produce a product using polymer clay. It’s a great foundation base which only aims at success for any crafter/artist. Price was right and so worth it. I’m sure I will touch base with the information many times while working. While it is wonderful to have you do your investigations on polymer clay, i detect a real bonafide scientist’s brain working here. I love it, especially after my having spent 40 years in science, a misplaced artist from way back. Love it, I appreciate it from both perspectives.